Connor Doran Appearing at Imagine Christmas 2011! 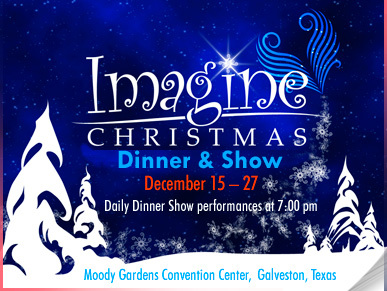 We are thrilled to be heading to Moody Gardens Resort in Galveston Texas to be a part of the Aerial Experience Productions show ~~ Imagine Christmas~~ . Aerialists, Acro Artists, Kite Flying, music and fun bring this modern day Nativity Story through fresh eyes & Recapture the wonder of God’s miraculous gift. Imagine Christmas combines inspiring music, beautiful dance and imaginative aerial acrobatics to tell the story of Christ’s birth in a way that evokes child-like wonder, awe and amazement. We look forward to seeing you there! For tickets and more information go to the link below. Tickets sold out last year so be sure to reserve yours early!